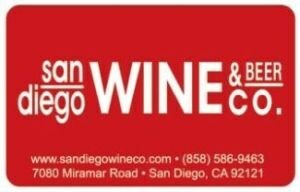 Gift Cards at San Diego Wine Co - San Diego Wine & Beer Co.
Wine and beer make a great gift! Your gift card can be used on our e-commerce store or in our brick and mortar store. You can now purchase San Diego Wine & Beer Co. Gift Cards online. Click HERE for our denomination selection. Select the denomination you desire and check out. Your gift card will be mailed by USPS, free of charge, within 24 hours.